Hostgator Discount Coupon will help you to save your money when you buy Hostgator Hosting. Here are a couple of Hostgator Discount codes which will help you save your hard-earned money. HostGator is a powerful hosting company. Hostgator offers unlimited hosting and bandwidth along with the Simple script and Fantastico, using it; you can quickly Install WordPress on Hostgator hosting. One thing which in particular I like about Hostgator is their excellent server quality. They also offer multiple ways to connect with support. Apart from support ticket & chat, you can always get in touch with them via phone. I prefer contacting them via Telephonic support, as it makes it faster to get hold of them. Moreover, when it comes to handling the load of a WordPress blog, Hostgator does the job pretty well. Here I’m sharing Hostgator Discount Coupons which don’t expire and you can grab huge discount when you buy hosting from Hostgator.I’m sharing two Hostgator discount code and depending upon your requirement and billing cycle you can use any of them. Also, remember this coupon code is valid for all shared hosting plans like Hatchling, Baby, and Business hosting plans. 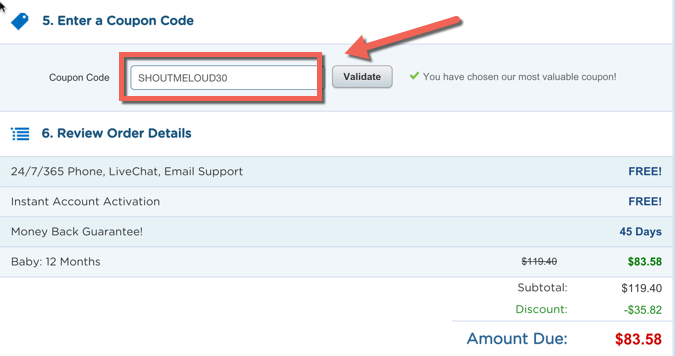 This is the Hostgator discount code that you will be using to get maximum discount on your first-year web hosting bill. This coupon code will let you grab 30% off on your first bill when you buy hosting from Hostgator. Using this coupon you can grab hosting from Hostgator for as low as $1. This HostGator Promo Code is good when you are buying hosting for one month. Especially if you are one of those who like to try thing before buying. Though Hostgator is always a good deal to spend money on. This HostGator 1 cent hosting discount code will let you enjoy the first month of web-hosting for only $0.01. Once your month is over, you can decide to continue or cancel your plan. You can sign up for the “Baby” or “Hatchling” plans with this coupon code. When you sign up, select your plan, (Hatchling for the single site, Baby for multiple sites), and in the domain field add the domain which you want to host. 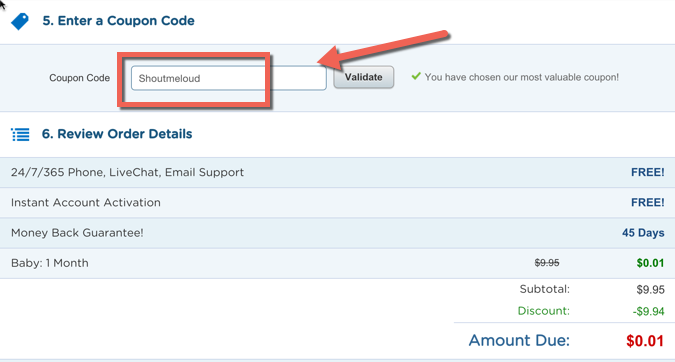 If you want to use an existing domain which you own, add that in the selected field, select your plan and tenure (one month), add “ShoutMeLoud” in the coupon field, and click on “Next”. You should be seeing a screen like the one above. Alternatively, if you plan to sign up for one or more year, you can use our special coupon code “ShoutMeLoud30” to get 30% off of the total bill. We will soon update this page with Hostgator VPS and Hostgator reseller hosting discount coupons. For now, you can subscribe to our Email newsletter to get quick free updates.